First up was master caster Dezachu. “After winning the LCK you’d be stupid to doubt ROX’s chances at qualification. Albus NoX Luna have been playing in a younger scene than the rest of the world and with a weaker line up – that leaves G2 and CLG. Consistency will be key between these two but I give it (very narrowly) to G2. SKT have looked pretty shaky this year (compared to KT/ROX) but still solid in comparison to other regions. I’m really intrigued to see how I May do but ultimately I think Flash Wolves will finish second which means yep – I’m placing C9 last. They’ve never looked consistently good without Hai on the Rift and even now there are too many chinks in their armour for international competitors to exploit. Edward Gaming – justification needed? Don’t think so. 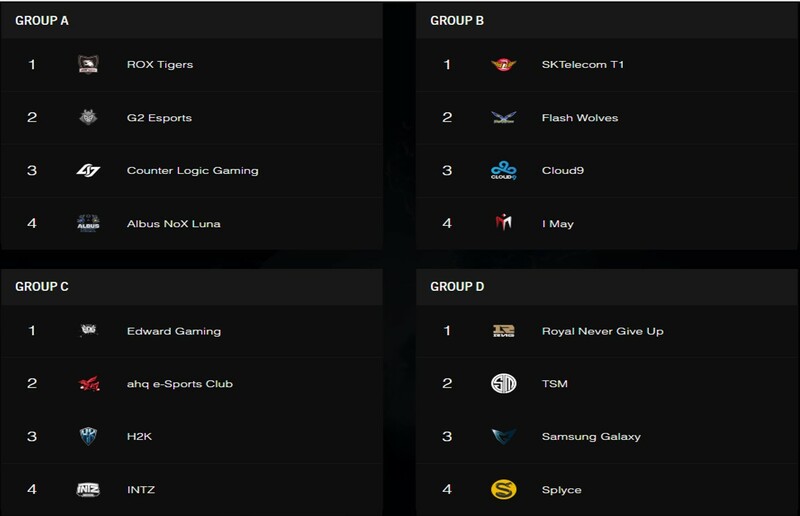 Controversially I’m gonna put H2K here. After all it’s an opinion and I’d love to see H2K come out and surprise us all! ahq 3rd, INTZ last. CS:GO caster and self-appointed “silver scrub” Jack was more succinct in his answer. As I pondered Jack’s reasoning, I was reminded of the prophetic Addyal and that perhaps less is more. He seemed confident and assured in his predictions needing few words to make his point. Potshot promptly sent me a thesis on the subject. “Ye of little faith, come forth and forecast doom for the West! 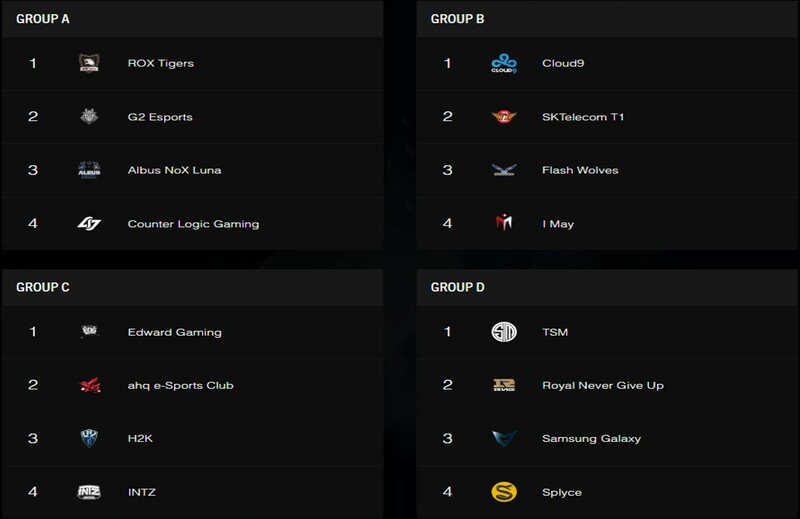 Group A is a thrilling potential mosh pit, but I predict G2 to make it out of the Tiger’s den. To pray that ROX might not make it out in first is nigh unfathomable. I’ve been impressed with G2’s mastery of the macro game this season and Trick might be one of the best junglers to represent Europe in recent years. Despite being a fan of MSI hotshots CLG, I’m predicting them to have to watch the rest of the tournament alongside ANL who need a miracle to claim a win at this tournament. Group B looks to be hotly contested; four vastly different styles coming to a head in what must surely be a 3-way brawl for 2nd place behind head wolf SKT. I’ve never seen a game of I May, an up-and-coming team at the end of an extraordinary road, but I’d expect them to prop up a table containing the hyped up C9 roster and the perennially underestimated Flash Wolves. I’m opting for the Flash Wolves to prevail over a sneaky Cloud 9 victory because they’ve shown they can deliver when the stakes are high (but in my heart of hearts I believe in the meme dream team). Group C is a similar story to the last. Again, I’m expecting the Taiwanese team to progress alongside the group favourites, though they’d have a mountain to climb winning against potential opponents in the next round. It’s hard to see H2K making a real impact at this tournament, and indeed they could be forgiven for starting a Reddit revolt by having INTZ take a game off of them. If EDG bother to scout their opponents, they should stomp this group. I was left reeling by the awful puns on player names. I was at a loss over what to do and my world was falling apart. Fortunately Luke was there to pick up the pieces of my broken pysche. Pretty sure he’s used to cleaning up my mess anyway, last minute social media posts and all. “While I hope my picks will be completely wrong I believe many others will be making picks similar to these. 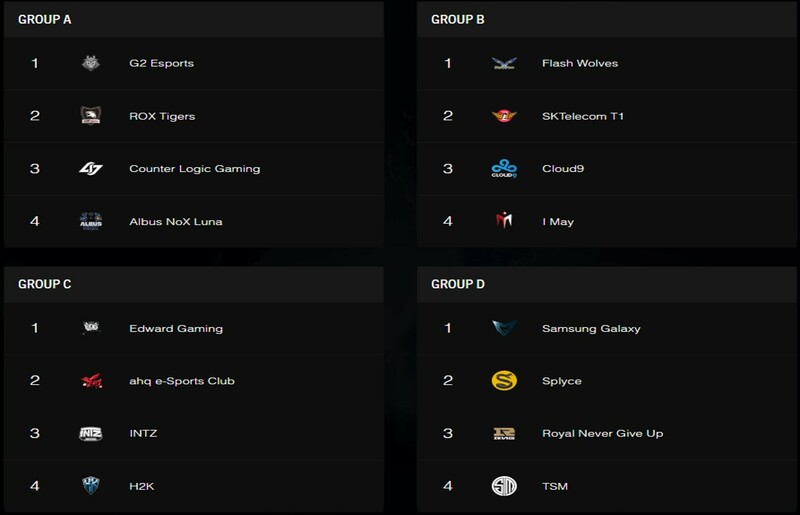 Group A will definitely see Korea’s ROX Tigers prevail followed by either G2 or CLG. Russia’s ANX could prove everyone wrong but with less experience I anticipate them to come bottom of Group A. 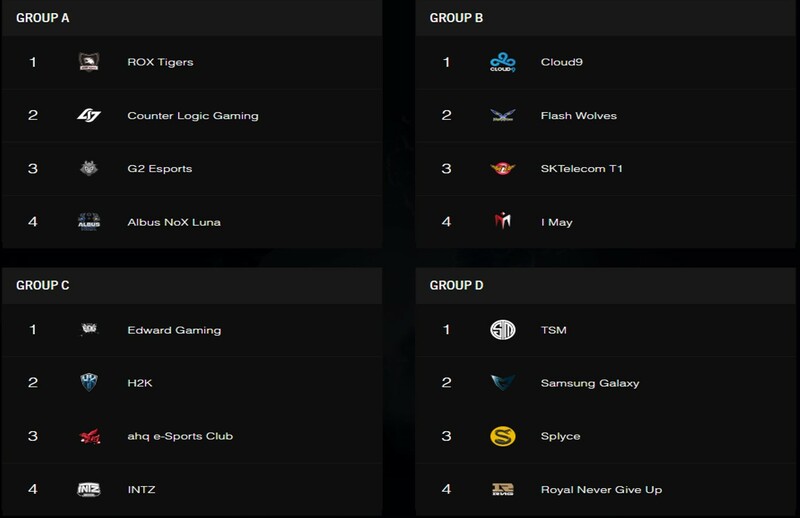 Group B… SKT T1 are the obvious top pick along with either Flash Wolves or I May… why did I May go last when they came 1st in the 2016 Season China Regional Finals? I just don’t feel they can continue their lucky streak. C9 will shock in the groups stage but inevitably be unable to stand up to the likes of SKT. In Group C, EDG are arguably one of the best teams in China, even after Fireloli, Athena and FireFox left for I May. EDG have near consistently won the LPL for 2 years which is an amazing feat although will they make it past the top four? I’m doubtful after last year and I would say nearly the same for ahq who came 1st in the 2016 Season Taiwan Regional Finals. H2K and INTZ are not going to be able to beat the Regional winners of China and Taiwan although I do secretly hope INTZ do a fantastic job for Brazil. Up next was the voice of our video recaps, Bobson. Group A: “An Old Dogs/New Tricks team from NA. I want them to do well because they’ve tried so hard in the past at Worlds. 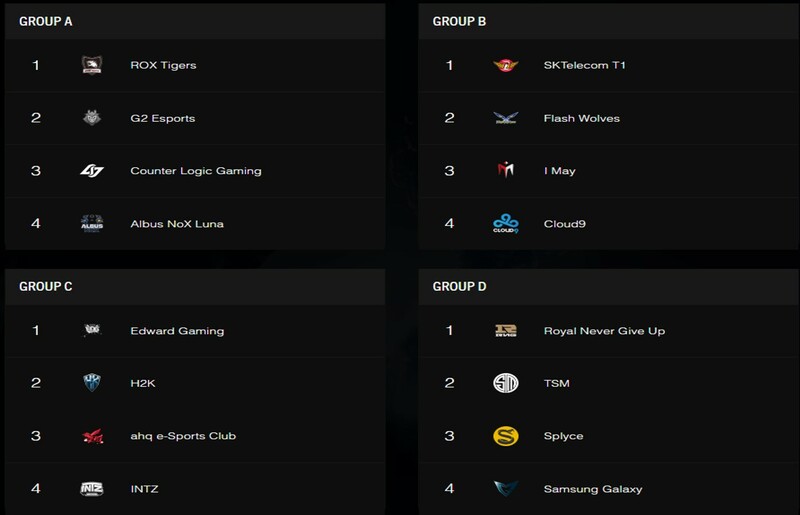 Group B: I just want even more SKT Skins to see Riot sweat. Group C: ahq have a good track record at Worlds. I see them at least topping groups. Bobson was concise, neat and complete in his response, all the characteristics that a good boss needs to stay organised. Up next was someone so nice they named him twice (different names though, otherwise that would be silly). “I think second seed will come down to whether Xmithie outperforms Trick and CLG doesn’t choke against ANL. G2 may very well have benefitted from getting second seed out of MSI. Calling it now that SKT doesn’t make it out of groups. Like EU, LMS looks weak because JT and ahq fell off, but FW remains as strong as ever and a Korean neutralizer. C9 with Impact on steroids and an improved Meteos (Zac incoming) having a strong chance of beating SKT in a BO1 format. Westdoor is going to be hurt hard by the midlane champion pool despite efforts to expand it this season. Unless Ziv pulls out a godlike performance, the rest of the team will lose too quickly to their H2K counterparts. All this discussion had put me on edge. I had to get involved. 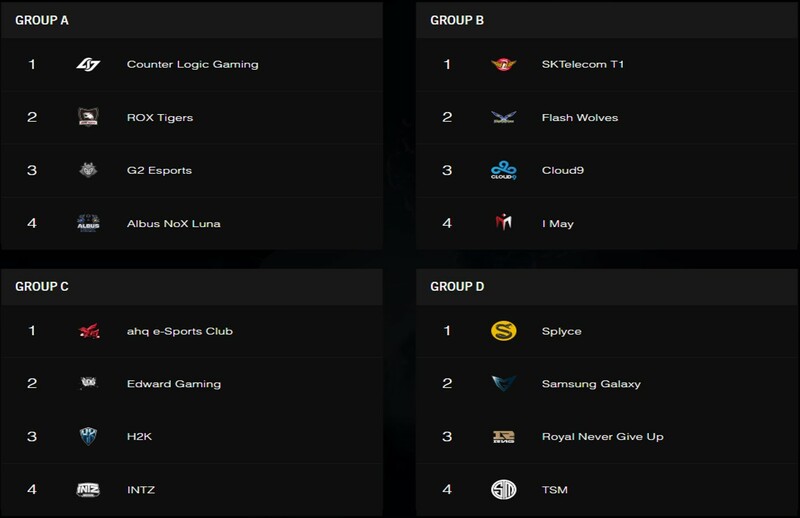 Group A: “The only competition for ROX Tigers in this group should be G2, but otherwise they should breeze through. ANL don’t stand a chance and I expect CLG to disappoint (sorry Adam). 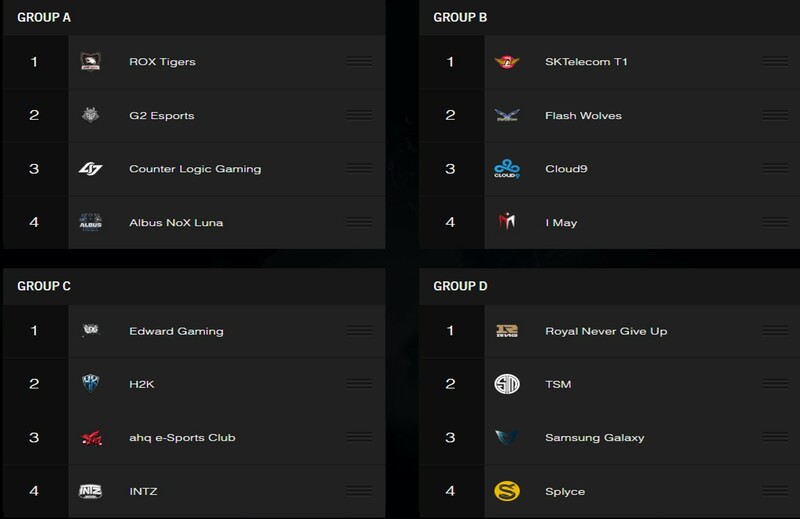 Group B: SKT will top the group followed by the Flash Wolves. The current meta suits Meteos of Cloud9 and Impact has looked strong, but I think the team’s weaknesses will be exposed by the higher standard of opposition… wait there’s a fourth team? 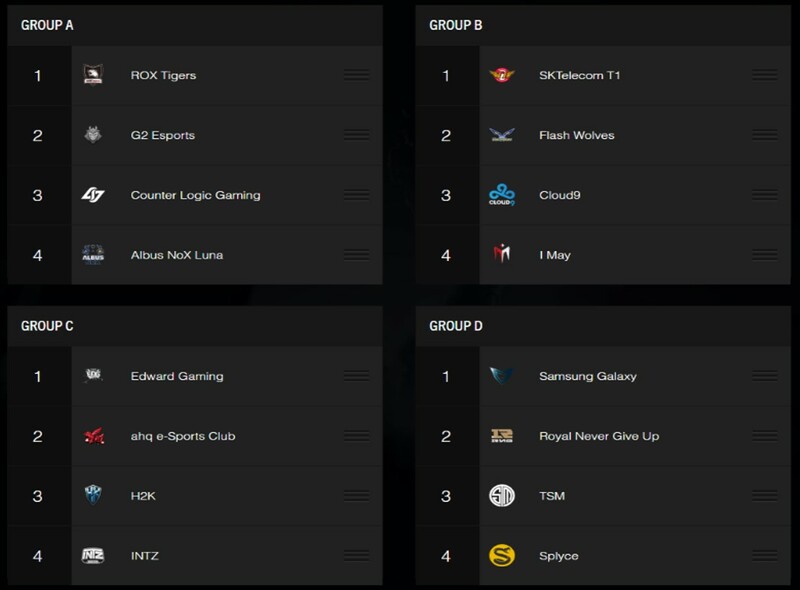 Group C: EDG to smash the rest. H2K will beat a much weakened ahq who aren’t what they used to be. I was tempted to put INTZ just above them, but Ziv will drag his team over the line. Westdoor to have Twisted Fate permanently banned and disappoint. Last of all was a man who needed no words for his predictions, a silent guardian, a watchful protector. He needed no language to communicate his predictions. He simply presented and left, leaving all others in awe. Such knowledge, such power. He asked for no skins. The glory of winning would be enough to sate him (unlike his mobile data plan. Candy Crush isn’t gonna play itself you know). Enjoy Worlds everyone and we’ll see you soon for the next NUEL tournament! Stay tuned.